DETROIT – Pai-Yen Chen, Ph.D., assistant professor of electrical and computer engineering at Wayne State University's College of Engineering, recently received a National Science Foundation (NSF) Faculty Early Career Development (CAREER) award, the organization's most prestigious accolade for up-and-coming researchers in science and engineering. 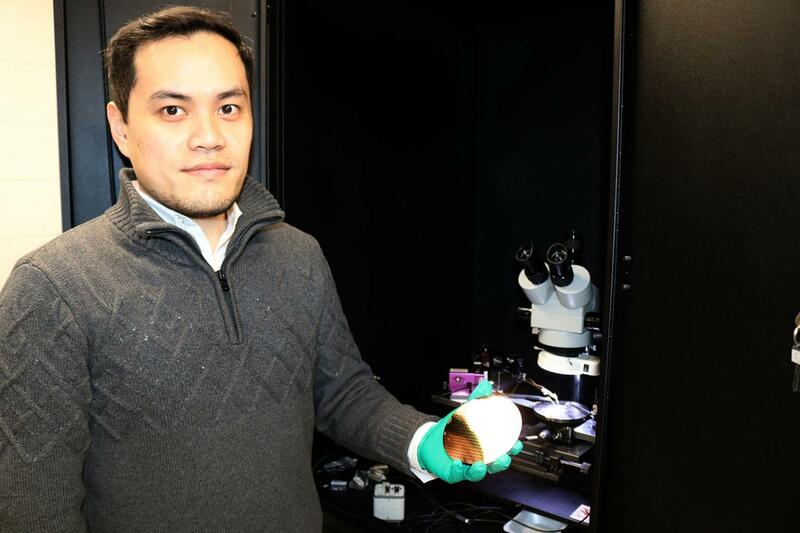 Chen is the recipient of a five-year, $500,000 grant for his project, "Integrated Research and Education on Self-Activated, Transparent Harmonics-Based Wireless Sensing Systems Using Graphene Bioelectronics." The microsensors in wearable health-monitoring devices are inexpensive, low maintenance and battery-free, but their performance is often hindered by electromagnetic interference. Chen's research examines the use of a graphene-based bioelectronics circuit in a harmonic sensor to reduce noise and create a more energy-efficient wireless system. Among the health care applications for this technology is a sensor for contact lenses that can monitor ocular health and improve eye care. The features of Chen's system — transparency, lightweight, flexibility and biocompatibility – lend themselves well to such medical uses. "If successful, the compact and transparent graphene harmonic biosensor can be integrated on the soft contact lens to sensitively detect targeted pathogen bacteria, infectious agents, diseases or metabolic changes of interest and wirelessly transmit data without any power source or sophisticated circuit," said Chen. "With further development, the proposed wireless biosensors can have broad impacts in health care monitoring." NSF CAREER awards emphasize the integration of research and education, so Chen plans to incorporate his work into new courses and outreach activities at Wayne State University, targeting under-represented groups and K-12 students through programs such as ReBUILDetroit, Richard Barber Interdisciplinary Research Program and WSU's STEM Days. Chen joined the Wayne State University College of Engineering faculty in 2014. He leads a research group dedicated to developing next-generation wireless microsensors and integrated systems based on innovative electromagnetics, materials and circuit technologies. Chen has authored more than 70 journal papers and 70 conference papers, holds nine U.S. patents, and co-edited a book and six book chapters. He has a Ph.D. in electrical and computer engineering from the University of Texas at Austin. Last year Chen received the SPIE Rising Researcher award, the IEEE Sensors Council Young Professional (Early Career) Award, the IEEE Senior Member, the URSI Young Scientist Award, and the NSF ECCS award (#1711409). The NSF award number for this grant is 1752123. Wayne State University is one of the nation's pre-eminent public research institutions in an urban setting. Through its multidisciplinary approach to research and education, and its ongoing collaboration with government, industry and other institutions, the university seeks to enhance economic growth and improve the quality of life in the city of Detroit, the state of Michigan and throughout the world. For more information about research at Wayne State University, visit http://www.research.wayne.edu.